The following is a guest post by Salkantay Trek Machu, a Cusco-based trekking agency that specializes in hikes along the Salkantay trail. Trekking up towards the highest pass on the Salkantay trail. Photo by McKay Savage, flickr.com. Salkantay was one of the main sacred mountains of the Incas, and is stilled revered today as an important apu, or mountain spirit. Covered by a perpetual glacier, the mountain dominates the landscape northwest of Cusco, rising up in the Vilcabamba Mountain Range in the district of Santa Teresa, La Convención Province. At 20,574 feet (6,271 m) above sea level, Salkantay is the one of the highest mountains in Peru. 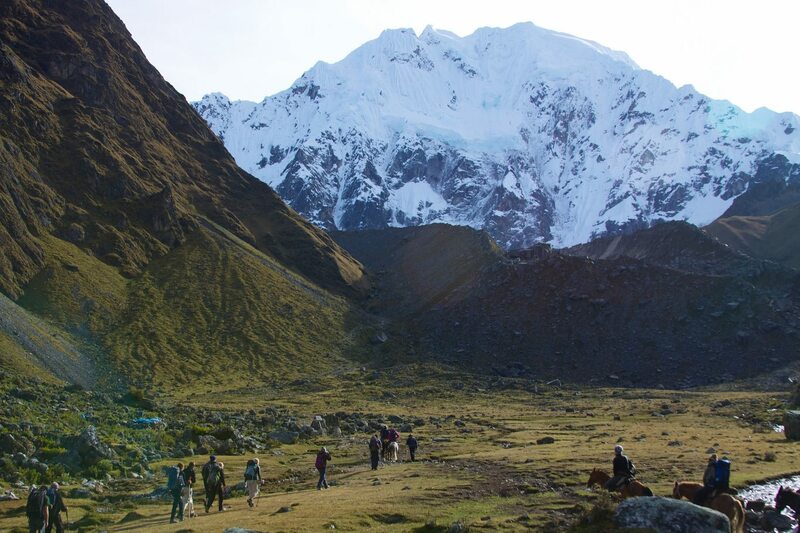 The Salkantay trek perfectly combines cultural experience and natural beauty. The walk takes you back to the time of the Incas and brings you closer to the apus, the sacred mountain spirits who protect the people of the Andes. The most powerful apus were usually the highest mountains in the region, such as Salkantay. The Incas performed rituals to communicate with them, using sacred prayers and offerings, asking for protection and prosperity for the coming year. These same rituals exist today. August is the most active time of the year for these rituals; local villagers near Salkantay say that at this time of year Pachamama (the Earth Mother) is thirsty and hungry, and it is necessary to satisfy her with offerings of the best food, giving Pachamama strength and energy. When you reach the Salkantay trail, you’ll soon pick up on the mysticism that permeates the area. 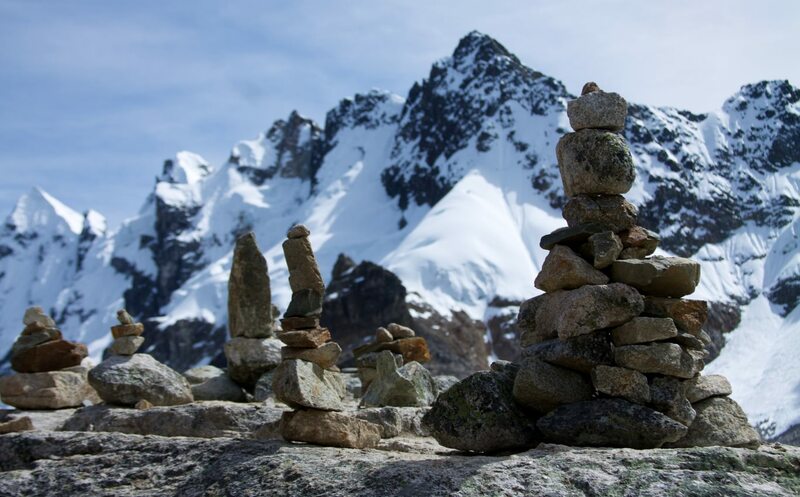 You’ll also come across strange piles of stones, similar to small cairns, dotted all around Salkantay. These are apachetas, offerings made by walkers, climbers and locals to the apu mountain spirits of Salkantay, and to Pachamama. Before you continue on, your guide (if you have one) will make an offering of his best coca leaves, asking for protection during the trip and as thanks for past journeys. Apachetas are considered sacred, so you have to be careful with them. If you knock one over, don’t expect any favors from the mountain spirits. Stone piles, or apachetas, along the Salkantay trek to Machu Picchu. Photo by McKay Savage, flickr.com. The Salkantay trek not only takes you through Andean mountains and snowy landscapes, but also sub-tropical forests with tropical plant species. As such, you’ll see a range of agricultural practices, different plantations and traditional farming methods. Agriculture is the main economic activity in this area. During your trek you’ll see plantations of coffee, cocoa, granadilla, banana and more, according to the season. You’ll also be able to meet the local farmers, so brush up on your Spanish if you want to have a good chat. Out on the Salkantay trail, surrounded by nature, the air is just about the purest you’ll ever breathe. Getting away from the pollution of large cities, you’ll be surprised how much the trek along the Salkantay route will allow you to cleanse your lungs, giving your whole respiratory system a boost despite the thin air at high altitudes. The stunning Humantay Lake along the Salkantay trek. Photo by Nicolas Rénac, Wikimedia Commons. 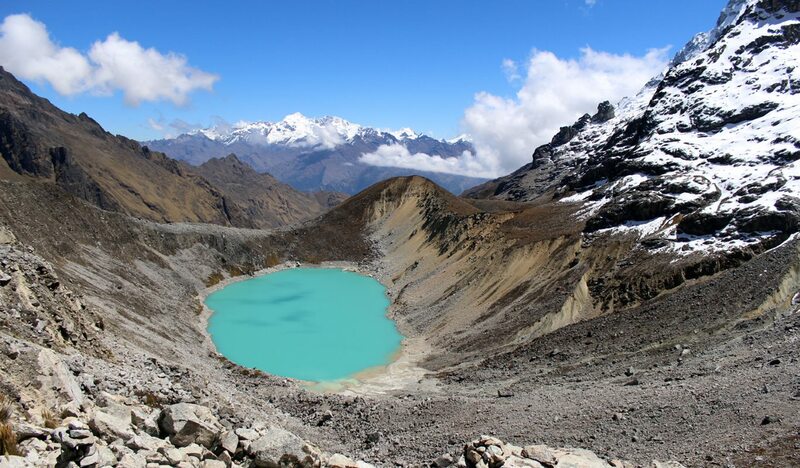 The Humantay Lagoon is one of the most beautiful natural attractions you’ll see along the Salkantay trail. Its stunning turquoise waters are quite a sight, with craggy snow-covered mountains in the background. The lake is important to the people of nearby Mollepata, providing a constant source of clean water for their crops and livestock. Humantay is well worth visiting even if you’re not doing the full Salkantay trek. Short one- and two-day treks can get you to the lake if you don’t have time to hike the entire trail. After a day (or days) of trekking, it’s hard to beat a dip in a natural thermal bath. The thermal waters of Cocalmayo come from a spring in the nearby foothills. You’ll have three pools to choose from, the hottest reaching 44 ºC. The waters are considered to have medicinal properties, and are particularly good for people with skin problems or bone pain. And, of course, for weary, aching Salkantay trekkers. The Salkantay trek is a challenge, but nothing that you can’t handle! Photo by McKay Savage, flickr.com. The Salkantay trek to Machu Picchu is considered a moderate hike but with some particularly challenging sections. Salkantay, therefore, offers both hardened trekkers and adventurous first-timers a good mix all along the route. The Salkantay trek has a total length of about 45 miles (72 kilometers). In general, Salkantay is considered a little harder than the Inca Trail but not as hard as, for example, the Choquequirao trek. Altitude, of course, is a major issue and can make some sections pretty tough. The highest pass on the Salkantay trek is at 15,256 feet (4,650 m) above sea level, which is a real lung-buster and higher than the notorious Dead Woman’s Pass, which is the highest point on the Inca Trail. But take it slow and one step at a time and you’ll conquer even these challenging sections. Because of the altitude, you should always take time to acclimatize when you first arrive in Cusco, and before you start trekking. 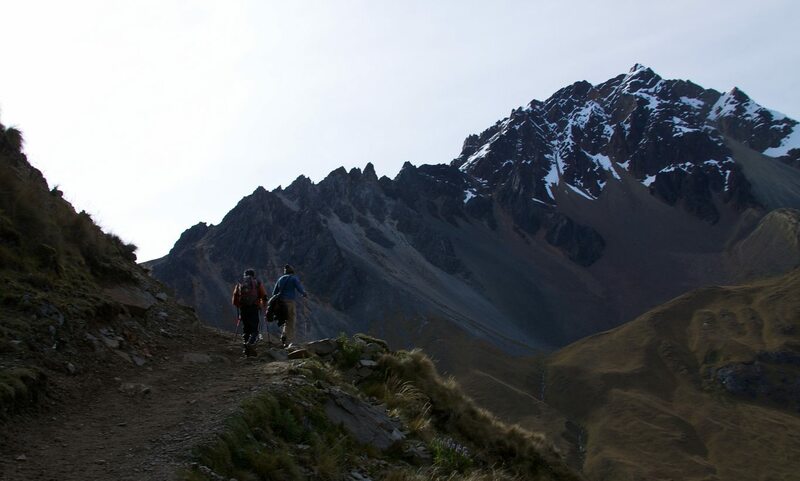 Despite the challenge of the Salkantay trek, you can still hike the trail with kids. So if you feel like you’re missing out on adventurous outdoor activities because of your children, consider bringing them along. Here at Salkantay Trek Machu, we recommend the Salkantay trek for kids of 10-years-old and above, as long as they have a good level of fitness and ideally some trekking experience. But if your kid simply hates trekking and the great outdoors, then they won’t have much fun no matter how physically fit they are. 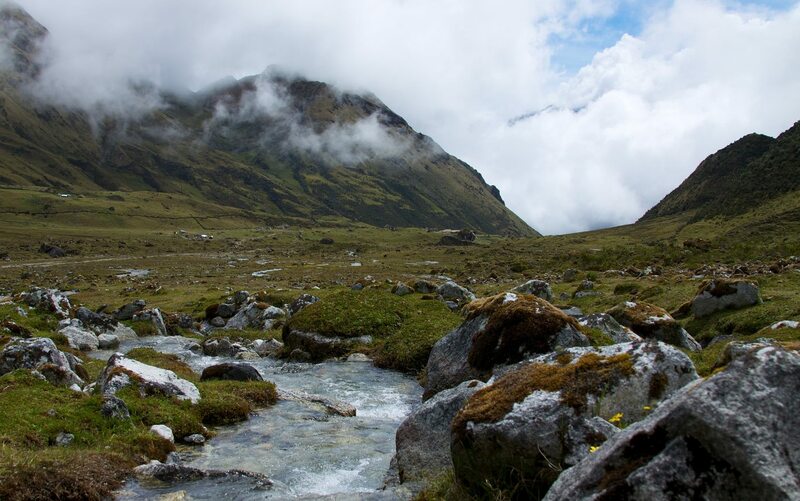 A cold creek winds through a valley on the Salkantay trek. Photo by McKay Savage, flickr.com. If you’re into nature and landscape photography, the Salkantay trek is one of the best options in Peru (and arguably better than the Inca Trail). The outstanding natural beauty all along the route, with incredible views and a variety of flora and fauna, will keep even the most demanding of photographers happy. On the way you’ll see stunning landscapes dotted with herds of cattle and sheep; you’ll see colorful birds and impressive orchids; and medicinal plants used by the Incas. If you’re really lucky, you might even spot a beautiful spectacled bear. Trekker traffic along the Salkantay trail is about 70% less than on the Inca Trail. That’s good news for anyone who likes to avoid other trekking groups and spend more time away from other tourists. Just one of many stunning landscapes along the Salkantay trek. Photo by Felipe Ernesto, flickr.com. All trekkers along the Inca Trail must have a registered guide. 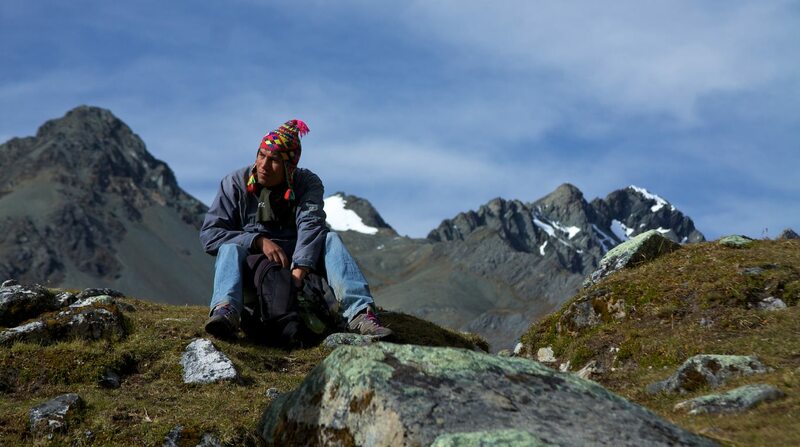 The Salkantay trek, however, has no such restrictions and is open to everyone. If you’re not an experienced trekker then you should probably go with an agency, who’ll provide a knowledgeable guide and sort out all your equipment, meals, routes etc. But experienced trekkers always have the option of doing the Salkantay trail independently, which is a big plus for more adventurous travelers. If you do decide to hike the Salkantay trek to Machu Picchu with a trekking agency, then you’ll find the whole procedure much more flexible and accommodating than the classic Inca Trail. Prices per-day tend to be cheaper for Salkantay, and you also don’t need to book your trek months in advance. In fact, you can normally book your Salkantay trek when you arrive in Cusco, and set off within a few days. Just don’t forget to buy your entrance to Machu Picchu. A local guide takes a well-earned break along the Salkantay trek to Machu Picchu. Photo by McKay Savage, flickr.com.